Aida Cassino is originally from Panama city, Panama, where she learned all the basic Latin dances: salsa, merengue, samba, etc. She moved to the US 20 years ago and in a desperate search for a workout that would fit her background, in 2007 she finally found Zumba! Zumba not only helped her with her fitness goals but also connected her back to what she loves to do, dance; it also gave her a home away from home! 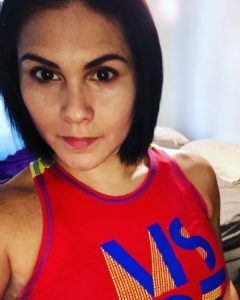 Aida became Zumba licensed in June, 2017 and started teaching with the goal of sharing with others what Zumba means to her: ‘it is not ‘just’ a workout. It is a healthy way to connect your mind and heart into dancing and having fun while burning calories, and it is also, creating long lasting relationships like a family; where each individual encourage and support each other.